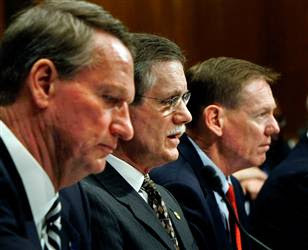 Today the Ford Plan was presented to Congress and Alan Mulally defended the loan requests for the Big 3. The hearings went well and we hope they are all listening. All three of the CEO's drove to DC in Hybrid vehicles. It should be noted that the only one that drove to DC in a production model vehicle was Alan Mulally in the 2009 Escape Hybrid. The only Auto company that seemed to have a clear plan for the future that is already in process was Ford. The Plan that Ford presented to congress is an adaptation of the plan that Alan Mulally put in place 2 years ago. We are well on our way and that is why Ford's sales dropped less than any of the other auto manufacturers, increasing our market share for the second month in a row.